I had quite a few people write emails, texts, or calls asking about my son’s week at military camp so I thought I would write it out today. Almost every time I told someone where I left him… I got two questions… is he ok? Are you having trouble with him? When I was growing up in a small town, it was an “it takes a village lifestyle”. I had multiple adults who would call me out on my behavior. I also was very fortunate to have some amazing coaches in sports that pushed me out of my comfort zone a little bit each year to help me grow. I was never the best at any of the sports and that didn’t matter. My coaches knew what I was capable of and expected me to do better. So what does that have to do with sending my kid to military academy?? Well today we don’t have a village and some of the coaches are just happy for the kids that do show up on the field and don’t get after them to try. Some teachers allow him to hand in homework 2 days after it was due and we don’t get letter grades until 6th grade! In my opinion, my kid was taking the path of least resistance and only doing what came easy or what he wanted to do. That just isn’t life. So this spring I provided him with 2 questions. What is your dream experience and what is a camp you want to do this summer? He chose game design and paintball so the rest was up to me to give him those while pushing him out of his comfort zone and showing him all the things he was capable of that his mind said he can’t do. Dropping him off was overwhelming. 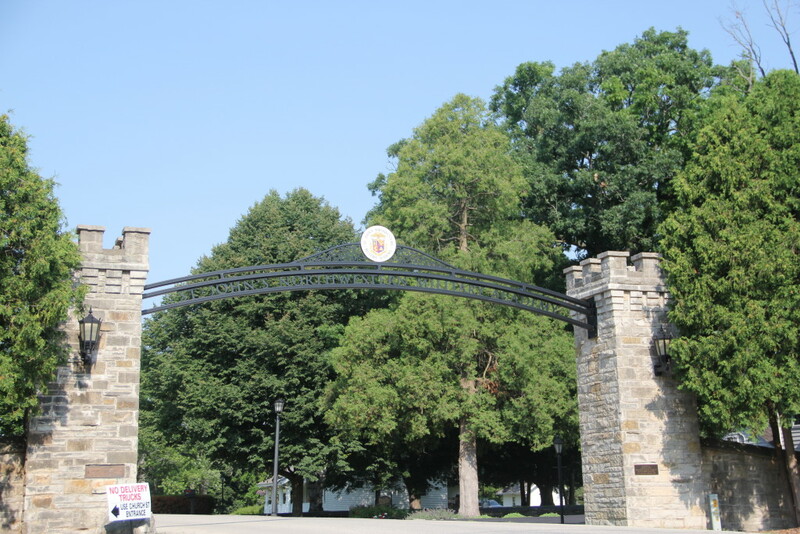 The campus was gorgeous (St Johns Northwestern Military Academy) but I got the schedule and they were waking up my baby at 6:30am for 30 minutes of exercise at 6:45am. OH BOY…he is going to love me for that one. The next item on the schedule that made my stomach turn…. High ropes course and drownproofing. So in one day they had him try to fall from heights and then drown himself. How was I going to leave him?? We picked up his uniforms (fatigues and athletic both were included) and had him change and meet the roommate. The look on his face at that moment I didn’t want to leave. Whoa… maybe part of not pushing him out of his comfort zone was ME. So big hug and off we go. The last day I finally got the smile on his face I was looking for in the pics and we were at graduation an hour early. My heart skipped a beat and it was emotional to see him as he marched around the campus in uniform with his company to the chapel where graduation was happening. He didn’t break a look and he was marching in a line. WHOA – is that my kid? His platoon won many awards including best at keeping their room clean. WHOA –is that my kid?? He seemed so much older as we listened to him say how he had to put on full uniform while in the pool and not drown. He told us about the team building activities and how he was not sure he had conquered his fear of heights yet but he did every exercise every time. The surprise of the week, he is good at archery… he scored of 42 the first time and the winner scored 45. Hardest things about the week… he said there was one teacher that pushed them harder but the most difficult was having 10 minutes to clean your room, shower, brush your teeth in the morning and be ready for room inspection. He realizes how slow he moves in the morning!! He said he was mostly homesick when someone was pushing him past what he wanted to do and when he was scared. But the verdict…he wants to go back next year because he will be 12 and able to participate in the hunter safety course and there are few things he wants to practice. Ahh… success…. The desire and thought on working at something to get better. So no I didn’t send my son to military camp for discipline or fear… I sent him so he would get out of his own way and realize underneath the boy that only does what’s comfortable is a growing man who is capable of anything he sets his mind to. As a former camp counselor, proud alum of the Academy, and current parent, I enjoyed your post. Thanks for sharing! I attended my nephews' graduation ceremony from Adventure Camp last July and now my own son will attend this year. I enjoyed your blog very much — thank you for sharing your family's experience! Thank you Sharon! My son went back again this year and we are heading to pick him up tomorrow. It is amazing how it helps them grow and develop!